April is Child Abuse Prevention Month. 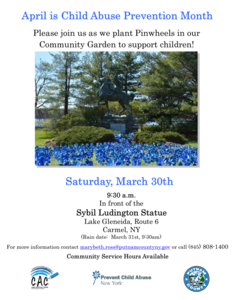 To spread the message that every kid deserves a great childhood that’s carefree and full of promise, The Child Advocacy Center of Putnam County (CAC) will once again be planting a community pinwheel garden on Saturday, March 30th, at 9:30 am in front of the Sybil Ludington Statue at Lake Gleneida on Route 6 in Carmel. (Rain date is March 31st). 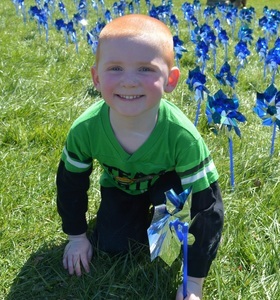 The “Pinwheels for Prevention” campaign is based on the belief that communities must be more proactive to prevent abuse. It’s not enough to simply respond to cases of abuse through prosecution and intervention—programs and policies that focus on child development, engage communities and create conditions that give parents the supports they need to succeed are essential. The CAC is a program of the Putnam County Department of Social Services. “The CAC has long advocated that education is imperative to preventing child abuse and continues to partner with local agencies to implement programs to ensure the physical, mental, and emotional health of children,” said Michael Piazza, Jr., Putnam County Commissioner of Social Services, Mental Health and Youth Bureau. According to Prevent Child Abuse America, research documents pervasive and long-lasting effects of child abuse and neglect on children, their families and society as a whole. Effective child abuse prevention programs ensure the health of children and families, allowing children to grow into adults who prosper and contribute to society. Among the tips provided by Prevent Child Abuse New York is acknowledging that parenting is a tough job. Here are some other ways to support parents: Reassure a parent coping with a difficult situation in public; Help amuse a restless child; Be a good neighbor and get to know the families in your neighborhood and point out the special things they do for their children. For your own kids, be patient and really listen when they speak to you, and make it a priority to spend time with them, undistracted by work and other demands on your time. For more information on how you can help prevent child abuse, or on prevention and education programs offered by the Child Advocacy Center, please call (845) 808-1400 or Prevent Child Abuse New York at 1-800-CHILDREN.